Excerpt from Vinita's book, "Merging with the Beloved"
Singing sacred songs and chanting has a deep and profound effect on our existence. There is a whole new realm of secrets about vibrations. Sacred chants like the Vedic Mantras, or Gregorian chants, are in the rhythm of the underlying vibrations of our existence. “Empower yourself through the use of your voice. Using the sacred sounds you’re going to entrain your physical body, every cell of your being to these sacred chants, which elevates consciousness. When you entrain to these sounds then you become the instrument, your vibrations resonate throughout your body, and elevates consciousness and can heal the physical body. That’s why sacred chanting is done, because then you are the vessel, for that sacred sounds. That’s what the words atonement and attunement have to do with sacred sound. To atone for one’s sins, is really to break free of remnant vibrations that you have been living in, that’s labelled as sin, and all it is a frequency state. Once you atone and let go of that, you’re bringing yourself back into an attunement with God, and you are resonating differently. And once you become a vessel and use your voice you are now vibrating, not only every cell of your being, but you’re also bringing your brain into a different brain wave frequency. The EEG goes from Beta, to Alpha to Theta. The slower the brain operates the more we have access to it. And those are the expanded states of consciousness and awareness. The slower the brain operates the more capacity it has, so when it slows down to between 8 – 12 Hz (cycles) per second that’s Alpha state, above 12 Hz is Beta, which is our normal state of operating, up to about 30 Hz. So if you drop below this you go into meditative states and even lower into [Theta and Delta] expanded states of consciousness.” – Shaman Steven Pawlak. There are many hidden truths to vibrations, and these secrets were encoded in the Vedas. Each Chakra has a vibrational frequency related to it. Let's look at the heart Chakra, called Anāhata, meaning unstruck [sound]. Subtle vibrations in the ether element come first in creation. 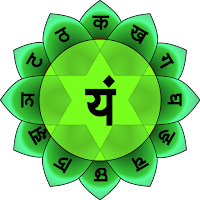 यं, Yaṁ, is for the heart chakra, and also the Beej (seed) Mantra for meditation. It is a subtle sound like a thought, so said within, not spoken. The gross sound that can be pronounced for the heart chakra is 'haah' (as in heart). Frequency is the key. Frequency of the heart is 528hz (the middle note in music, the middle Chakra). In the process of creation, after the ether element comes the air, Prana. The Green blade of grass converts the energy from the sun, creates oxygen. After the air element comes light, in the color spectrum heart is green. Sound creates form, from matter and energy. This is demonstrated by Cymatics, that's the Yantra, now known as sacred geometry. 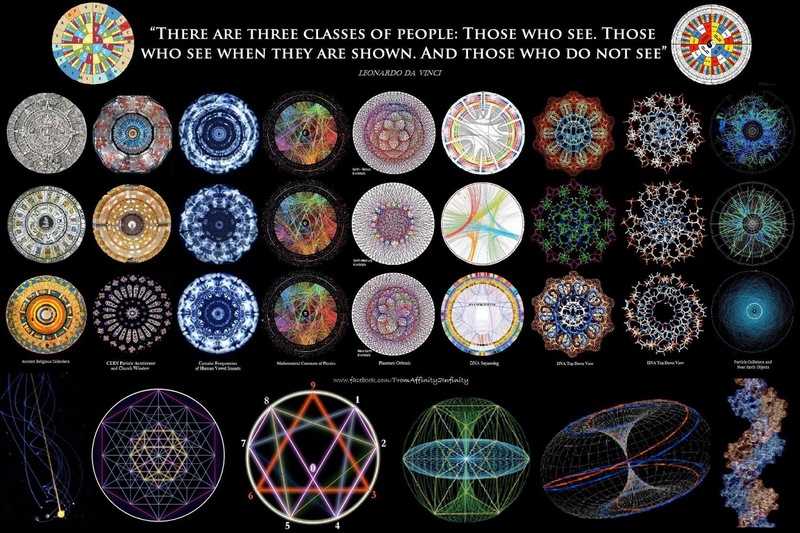 Geometry is about numbers and numbers are the language of creation. Water is liquid crystal. Our body is eighty percent liquid - crystal. When frequency of 528hz is mirrored in the water it creates geometric patterns, Yantra, of the heart, the star of David, the 2 triangles. Therefore; each sacred geometric pattern, Yantra, has corresponding mantras at subtler level. Because from vibration comes matter. Heart is love when at 528hz, reverse is fear and hate. The emotion of love is a very large electromagnetic field of vibratory pattern. Our Chakras are at the endocrine glands. Hormones are electromagnetically charged. Sound heals the soul. Love is the universal healer. Water is universal solvent. Music is the universal language. As is the microcosm, the spiritual body of Chakras, so is our collective consciousness, and so is creation or macrocosm, the seven Lokhs (dimensions). There's much more to be unravelled. The sacred sounds and songs that have originated from the deep transcendental state of the Creator, when sung, generate the same state in the one who sings them. These are set in the rhythm of the natural meditative breath. The rhythm of sacred sounds takes one into deep meditation and higher states of consciousness. The songs support this experience. In the Vedic system of sound, Nada Yoga, each vowel sound and musical note is associated with a Chakra. These vowel sounds are found in most ancient mystical traditions including the Egyptians, (Jewish) Kabbala, Mayans, Native Americans, Tibetans, and so on. When the vowel sound is pronounced, such as 'Aa' one will feel the vibration in the associated chakra, for 'Aa' it's the heart Chakra. Sound Healers like Jonathan Goldman, who is one of the best in the world, have developed an extensive model of sounds and harmonics. Shanti Shivani is a leading Naad Yoga, sound healer and Drupad singer in the US. Talk about attunement with the teacher, while learning from her DVD, each cell was strung with her voice. The ancient Vedic system of sounds, combined by a pure, evolved and authentic practitioner can transform the entire being. The tonal framework of the Vedas is set in rhythms called 'Ragas' and they have emerged from cosmic consciousness at the start of creation. When sung accurately, each has a unique effect on a human being, as they are in rhythm of the underlying vibrations of existence. At the substratum of our existence is consciousness. From consciousness comes the primordial energy (Shakti), then vibrations, from vibrations - subtle divine light, from light - matter. As our body is matter and of this three-dimensional reality, this subtle light is part of our subtle higher dimensional existence, vibrations are subtler and closer to consciousness which is the subtlest. Ancient meditators tapped deep into their consciousness and experienced these lights, sounds and vibrations. They then formed hymns and chants that would create the resonance of these vibrations within, because vibrations are the link to consciousness, and brings one closer to the experience of consciousness. It is the vibrations of the chants that is more important than the meaning, as Sanskrit and Hebrew are energy based languages. That is why the Vedic practitioners were so strict about learning and pronouncing Mantras in the correct rhythm. Vedic mantras are energy formulas. The experiments by Peter Garjajev, and his colleagues, about the vibrational behavior of our DNA has proven that DNA responds to extremely focused light and sound vibrations at particular frequencies and hence can be instructed to perform tasks or exchange information accordingly. That is why the extremely precise vibrations from the chanting of Vedic Mantras and the light from the fire ritual (Yagya), was performed. It was for creating health at the cellular DNA level. The secret is connection of Mantras with DNA and the Rishis knew this. Mantras purify. Mantras are another whole mystical subject. A purified one can use mantras as formulas. In one of their experiments, the Russian scientists were able to beam the genetic patterns of salamander embryos onto frog embryos and thereby instructed the DNA of frog embryos to convert itself into salamander embryos. And they did! Without any physical intervention, or surgery, or drugs, not even touching –by just beaming genetic patterns the scientists were able to convert frog embryos into salamander embryos. Their research has led to many groundbreaking and paradigm-shifting discoveries with one of them showing that DNA is able to absorb and emit vibrations, which spirals along the double helix in sacred geometrical form. Literally, DNA creates magnetized wormholes in the time-space fabric. DNA acts as “tunnel connections between entirely different areas in the universe through which information can be transmitted outside of space and time. The DNA attracts these bits of information and passes them on to our consciousness.” The researchers found that with the presence of light (photons) at a certain vibration, DNA activation and thus evolution can occur. It is this DNA activation that takes us to the next level of evolution. Vibrations therefore effect our evolution to the next level of physical and spiritual ascension through DNA activation. Each object has a resonant frequency. Every organ, each human being has their own unique soul signature, so does each planet, and so on. When you in the presence of an evolved being, your soul starts resonating with theirs, and you feel vibrational elevation. It is like two tuning forks, when one is struck the other starts resonating at the same frequency. Each object a person wears for a while carries their vibrations. The places where spiritual practices or events happen carry a higher vibration in its subtle space. In locations where a person or people have attained liberation the transcendental vibrations stay for ages. These become places of pilgrimage. If you have become aware of your subtle body you can feel these subtle vibrations from other people and places. In Bharat (India) there are many places which are pregnant with these sweet, divine, transcendental vibrations. Be in resonance with your true divine Self!